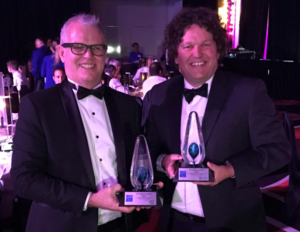 WGV at White Gum Valley and Rosehill Waters took home awards at Saturday night’s 2017 Urban Development Institute of Australia (UDIA) Awards for Excellence, showcasing the industry leading projects that Josh Byrne & Associates (JBA) are proud to be part of. Rosehill Waters won the EnviroDevelopment Chairman’s Choice Award, an award that recognises an outstanding EnviroDevelopment Certified project delivering a sustainable community that is ‘living for the future, today’. In his role as Sustainability Consultant, JBA’s Mark Taylor was initially engaged by Handle Property Group to assist the project with a submission to increase the density coding, which included developing a bespoke sustainability strategy. JBA was then further engaged to provide facilitation of the EnviroDevelopment rating, development of Design Guidelines and a Resident Welcome Pack, and provide technical input to marketing and engagement for the project. WGV at White Gum Valley won both the Urban Water Excellence and Sustainable Urban Development awards. WGV is a LandCorp ‘Innovation through Demonstration’ project and a Water Corporation Waterwise Development. JBA is the Landscape Architect, Urban Water and Sustainability Consultant for WGV and drove the delivery of the WGV Waterwise Development Exemplar (WDE) initiative. The project learnings of WGV are being shared with the wider industry through events, tours, videos and technical publications communicated via the WDE. Driven by JBA this program is supported by and shared through Water Corporation, LandCorp, Department of Water and Environmental Regulation, City of Fremantle, CRC for Water Sensitive Cities, CRC for Low Carbon Living, Curtin University and UDIA. The UDIA Awards for Excellence have been specifically developed by and for the development industry to recognise excellence and innovation in WA development.